Helena from Belfast wrote and asked whether I have a good Christmas fruit cake recipe. I sure do. Here is an absolute beauty, published in my very first cookbook ‘Great Vegetarian Dishes’. It was originally given to me by Hari Bhakti Dasi who got it from her mother. The secret of its moist texture, without any eggs, is the mashed pumpkin or potato. Try it – you won’t be disappointed. 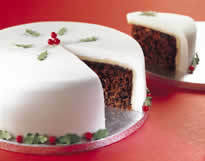 This traditional fruitcake is ideal for weddings, birthdays, or any special occasion requiring a luscious, rich cake. It can be kept for several weeks after baking. Line the base of a 20 cm (8-inch) cake tin with greaseproof paper. Dip a pastry brush in melted butter and brush the sides of the tin to give an even shine. Sift both flours into a large bowl and set aside. Combine the fruit, sugar, butter, syrup, and water in a heavy 4-litre/quart saucepan. Heat slowly over low heat, stirring constantly until the sugar dissolves. Raise the heat and allow the mixture to boil. Reduce the heat and simmer for 20 minutes. Remove the saucepan from the heat, mix in the bicarbonate of soda, and set aside to cool. When the mixture has cooled to room temperature, fold in the yogurt and mashed potato or pumpkin. Beat the mixture until smooth. Gently fold in the flour mixture with the fruit mixture, combining carefully. Spoon the combined mixture into the prepared cake tin. Smooth out the mixture. Cover the tin with aluminium foil (or brown paper secured with string) and bake in a moderate oven 180°C/355°F for 1 1/2 – 2 hours. The cake can be uncovered for the last 1/2 hour of the cooking. To test whether the cake is done, insert a skewer through the centre of the cake. The cake is cooked if the skewer comes out clean. If the cake is done, remove it from the oven, allowing it to cool in the tin. (This will stop the cake from breaking). When the cake is cool, carefully remove it from the tin and peel off the greaseproof paper. Now the cake is ready for icing, if desired.